In Málaga you can find coffee to suit all tastes. There are so many different varieties, degrees of strength and ways to drink it; you need an authentic coffee dictionary to understand the difference between each one. Café Central is one of the most historic cafes in Málaga and pioneer of the revolutionary coffee ordering system in Málaga. A system that is now common place and spreading quickly. It all began 50 years ago at the heart of the Plaza de la Constitución, in Café Central. The creator of the system was one Don José Prado Crespo, who ran this once small working class bar; where people would meet to talk, sing and catch-up. The bar is still run by the founder's family and tradition is the order of the day. They still source their coffee locally and have been using the same brand of coffee for over 70 years; always from the same local provider. "This is ours" - exclaims Ignacio Prado, the grandson of Don José Prado Crespo, demonstrating his loyalty and support for Málaga. The measuring system is unique to Málaga and has become part of the city's cultural heritage. It was first developed to help Don Jose Prado get to the bottom of exactly what customers were asking for. "A finger of coffee," was the traditional Andalusian way of ordering coffee. However, you could often end up serving too much or too little coffee with a finger measure. This led to wastage, especially problematic in the post-civil war era, as coffee was particularly difficult to get hold of, and expensive. Don José solved the problem by devising a unique system tailored to meet the needs and tastes of every customer. The system was quickly adopted by other establishments and is now a hallmark of the city's coffee establishments. 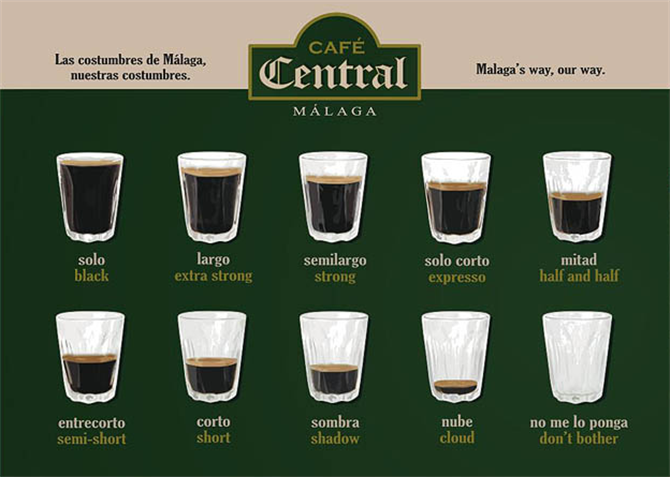 So how do you order coffee in Málaga? With the open and sociable character of the Spanish, going for a coffee is part of the culture. Don't be surprised if you are offered a "nube - a cloud," or a "mitad - a half and half" or a "sombra - a shadow". As quirky as the names sound, they are all based on the proportion of coffee to milk. Nube: A glass of milk with a dash of coffee. Largo: A glass of coffee with a dash of milk. Solo: All coffee, no milk. The entrecorto - semi-short and semilargo - strong, are the least popular and not recognised outside of Málaga.